Street Dance – A Park District Tradition for years to come! Home homepage Street Dance – A Park District Tradition for years to come! 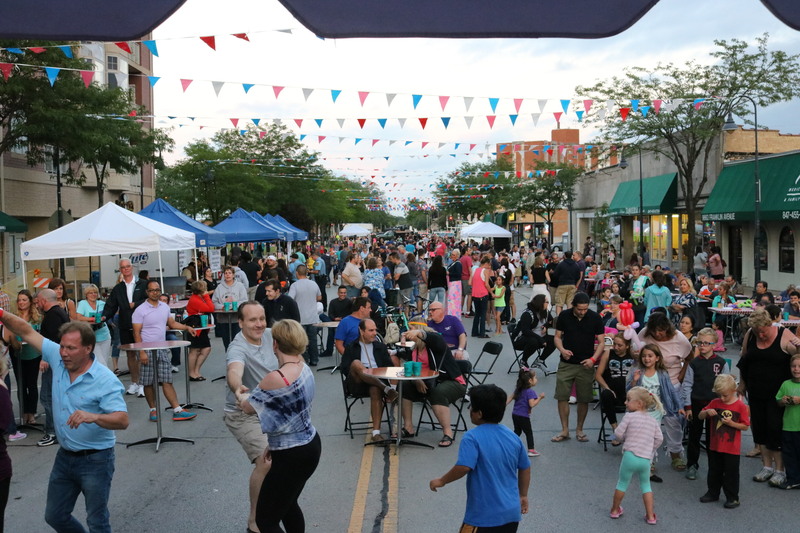 This Summer the Park District celebrated families by planning, organizing and implementing a family tradition in Franklin Park, Street Dance. Street Dance had everything to offer, gigantic inflatables, bubble soccer, food trucks and bands that every child wanted to dance to. The event kicked off on our small stage with our Sunshine and Discovery Day Camps highlighting their variety show performances to parents and friends. Children also had a chance to jump, slide or run through the different inflatables stationed throughout the field. Families participated in bubble soccer, organized by Thunder Soccer. This was a great way for families and friends to interact in fun competition. The face painters and balloon artist were another great hit for children. Children selected for incredibly detailed themes. While they waited in line they took a chance at the carnival games. One highlight was volunteering for the dunk tank. Either taking a seat or taking a shot, Park District families, Commissioners and staff took their turn in the hot seat. All proceeds went to the Parks Foundation. Proceeds of the Parks Foundation provide scholarships for Park District residents to participate in our programs. Children enjoyed the Park District area which included a prize wheel, photo booth to commemorate the evening and burgers and hotdogs for all who stopped by! The variety of food options for families to enjoy was endless. With pizza or tacos to gelato or cookies, all appetites were satisfied. Families enjoyed refreshments while listening to the sounds coming for the stage. Ladies Night, a local band, kicked off the evening singing current hits. Followed by Cover Gurl performing songs we all love – from classic to current! The evening concluded with the band, Breakfast Club, playing high energy classic 80’s rock! The theme of the entire event was highlighted with over twenty children on the stage singing and dancing with the band! It was truly a memorable family event. An event families will look forward to year after year!